Saint Peter is an enigma. He was the leader of the early Church, the man who Jesus referred to as The Rock. But how did a simple Galilean fisherman become the first Pope? Join beloved actor David Suchet (PBS’s Poirot series) as he embarks on an epic journey from Galilee to Rome in search of Saint Peter. 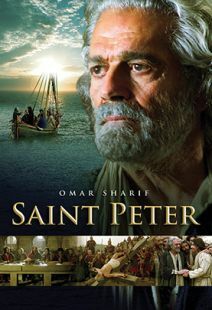 In this major two-part documentary series produced for the BBC, Suchet explores how a humble fisherman, known for his stubborn and impetuous personality became the leading figure in the early church, playing a key role in keeping the movement from splintering. Suchet travels from Peter’s humble Galilean birthplace to Jerusalem, where a terrified Peter denies his beloved friend and teacher on the eve of the crucifixion. Encounter Peter’s miraculous transformation on the day of Pentecost and follow him to Rome where tradition tells us be became the first bishop, the head of the Roman Catholic Church. 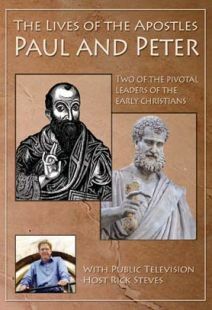 A fascinating, two-part program about the leader of Jesus's apostles and founder of the early Christian church, In the Footsteps of St. Peter clarifies historical accounts of Peter's life and work, along the way making him more human and understandable. Actor David Suchet (Poirot) is the charming, wide-eyed host, bringing touches of warmth and humor to a subject that could easily turn scholarly and esoteric. 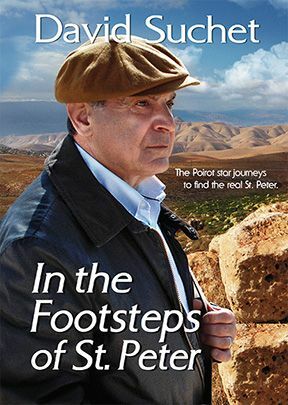 In the first segment, Suchet visits Peter's birthplace, the village of Bethsaida in the province of Galilee, and also his home as an adult and family man in Capernaum. 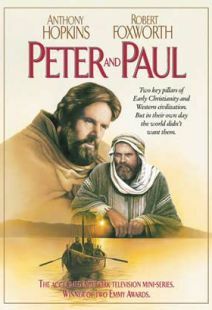 Between archaeological evidence, biblical accounts of Peter's life as a fisherman, and cultural clues from the region, a chain of hypotheses are assembled to create a viable narrative of Peter's life as a husband and father, working man, and eventual follower of Jesus. The most interesting aspect of Peter's story here is the lengthy exploration of his role as Jesus's right-hand man, a trusted disciple who also struggled to understand Jesus's reasons for unpredictable acts such as raising a ruckus against the moneylenders in a holy temple. Several historians here also suggest that Peter was somewhat impulsive, a man who would cut off the earlobe of an enemy or deny his association with Jesus when the going got tough. Part two focuses on Peter's first small steps at organizing the foundation of the church. 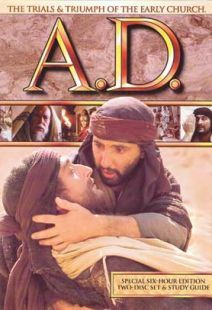 Sure to appeal to both Christian audiences and history buffs, this is highly recommended. Watching the BBC documentary In the Footsteps of St. Peter, it’s hard to tell if host David Suchet is himself a Christian—and that’s a good thing. A host who hides his perspective not only saves himself from defending his position, he ironically wins the respect of both faithful and faithless, which Suchet and the documentary do in this case. In the two-hour series, which follows the life of the headstrong apostle credited with founding today’s church, Suchet (best known to mystery lovers as Hercule Poirot) takes us through several of Peter’s high points. We see the rubbly remains of first-century Jewish homes in Peter’s old neighborhood. We go fishing on an ancient boat in the Sea of Galilee. We stand in the surprisingly tiny courtyard where the disciple denied knowing Jesus. All this may sound like something you’d catch on a travel channel, but the series lends more gravitas and humanity than you’d expect. When we peek into the stony caverns in Caesarea Phillipi where Jesus told the apostle, “You are Peter, and on this rock I will build my church” (Matthew 16:18), Suchet beckons us to imagine the ancient scene. Did Jesus point at Peter, implying that he was the rock? Was he referring to the nearby stony mounts where pagans kept their idols? Suchet himself pauses to reflect on this bit of theology. The documentary doesn’t lose its focus on Peter, and Suchet gets kudos here for masterfully steering the show. He becomes your cheeky museum guide, your Bible historian, and your thoughtful friend. As he talks to scholars on debatable aspects of Peter’s life, he plays the inquisitive student too, never questioning the answers, just smiling and taking note. This last point is important, as the documentary does not intend to convert anyone or refute anything. It assumes you have never read the Bible and never visited Israel. Still, even learned believers will find intriguing the tidbits from the scholars and the sometimes breathtaking visuals of Peter’s stomping grounds.